Balloon holder window clip that contains your balloons with out twisting or bending. These large balloons will attract attention to your dealership! Made from 100% natural, biodegradable latex. These large balloons will attract attention to your dealership! Made from 100% natural, biodegradable latex. High quality string. No helium? No Problem! Check out our line of No Helium Reusable Balloons. Custom designs available! Pole guaranteed not to break. With the help of our efficiently designed clips, clasp your poles onto car windows to showcase the show cars. 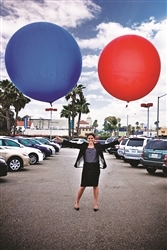 These large balloons will attract attention to your dealership! Made from 100% natural, biodegradable latex. Finally, a way to eliminate the cost of helium and short term latex balloons! These innovative holders will last months, not days. Two-Piece Holder with quick turn release allows easy separation from the window clip. Each kit includes one Balloon Adapter Clip and a Two-Piece reinforced Balloon Holder. Clip-on car window holders are 30" tall and made of fiberglass and reinforced plastic. Balloon Adapter Clip is necessary to attach balloon to holder. Your custom design now available! 10 minimum quantity only! Available in all styles kits or replacement balloons. 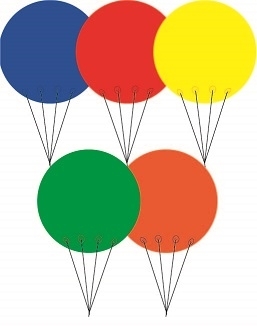 10 minimum (mix and match balloons & kits) two sided imprint available. No helium? No Problem! Check out our line of No Helium Reusable Balloons. 1 Reusable Balloon, 1 Adapter Clip, & a Two-Piece Holder. Custom designs available! Heavy Duty 72 count bag of 17 inch Mega-Tex premium helium quality balloons. Perfect for use with the Balloon Gizmo! Available in Multi-colored and Red / White / Blue. No helium? No Problem! Check out our line of No Helium Reusable Balloons. Each Kit includes: 1 reusable balloon, 1 adapter clip, & two-piece holder. Pole guaranteed not to break. Giant 20 inch reusable balloon. Custom designs available! Attract attention to your dealership with these three popular design! Made from 100% natural, biodegradable latex. Sold in bags of 50. Made of Chloroprene or Duroprene rubber. Easy inflate- small diameter tapered neck. Use with pure helium or air/helium mixture. Outdoor quality helium balloons, perfect for car dealerships. Bright colors, high quality latex. Packaged per gross (144ct.) Available in standard solid color bags. Special assortments available. Outdoor quality helium balloons, perfect for car dealerships. Bright colors, high quality latex. Packaged per gross (144ct.) Available in standard solid color bags. Special assortments available. Reusable balloon ground pole kit. With fence base use to hold up your balloon poles up. Kit includes: One 35 inch tall aluminum pole, one 30 inch balloon holder, one adapter clip, choice of one reusable balloon, and one fence base. Overall height 8 foot. Guaranteed not to tip! Unique twist notch-lock design allows these balloon holders to be interchanged with our Window Clip (EZ533). Reusable balloon ground pole kit. With steel ground spikes that insert into the ground while holding your balloon poles up. Kit Includes: one 35 inch tall aluminum pole, one 30 inch balloon holder, one adapter clip, choice of one reusable balloon, and one steel ground spike. Overall height 8 foot. Guaranteed not to tip! Unique twist notch-lock design allows these balloon holders to be interchanged with our window clip (EZ533). Attract attention to your dealership with these three popular design! Reusable balloon ground pole kit. With water base on the ground that holds your balloon poles up. Kit includes: one 35 inch tall aluminum pole, one 30 inch balloon holder, one adapter clip, choice of one reusable balloon, and one water base. Overall height is 8 foot. Guaranteed not to tip! Unique twist notch-lock design allows these balloon holders to be interchanged with our window clips (EZ533). Custom reusable balloon ground pole kit. With steel ground spikes that insert into the ground while holding your balloon poles up. Kit includes: one 35 inch tall aluminum pole, one 30 inch balloon holder, one adapter clip, choice of one reusable balloon, and one steel ground spike. Overall height is 8 foot. Guaranteed not to tip! Unique twist notch-lock design allows these balloons to be interchanged with our window clip (EZ533). Custom reusable balloon ground pole kit. With water base on the ground that holds your balloon poles up. Kit includes: one 35 inch tall aluminum pole, one 30 inch balloon older, one adapter clip, choice of one reusable balloon, and one water base. Demand attention to your storefront with this durable trio suction cup kit. Each kit includes: 1 triple cluster suction cup, 3 balloon holders, 3 adapter clips & reusable balloons. Poles guaranteed not to break. Giant reusable 20 inch balloons. Custom design available. Use on smooth non-porous surface. Easy application & removal. Demand attention to your storefront with this durable trio suction cup kit. Each kit includes: 1 triple cluster suction cup, 3 balloon holders, 3 adapter clips & reusable balloons. Poles guaranteed not to break. Giant reusable 20 inch balloons. Custom design. Use on smooth non-porous surface. Easy application & removal. Made of Chloroprene or Duroprene rubber. Easy inflate- small diameter tapered neck. Use with pure helium or air/helium mixture.